Finally, we have done a revamp of the entire website and we hope that you like it! 2010 is the World Championships and of course we hope that there are no civil injuries and that the best team comes out on top!! If you are currently training or playing soccer please bookmark this space for free workouts and recipes! 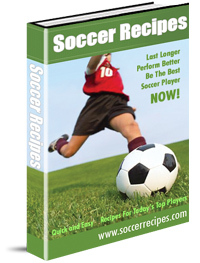 Posted by Author Name in Soccer Recipes / No Comments. The author is a professional athlete for the past 10+ years in Europe. These recipes are in my own bookshelf and are used throughout the seasons as a professional.